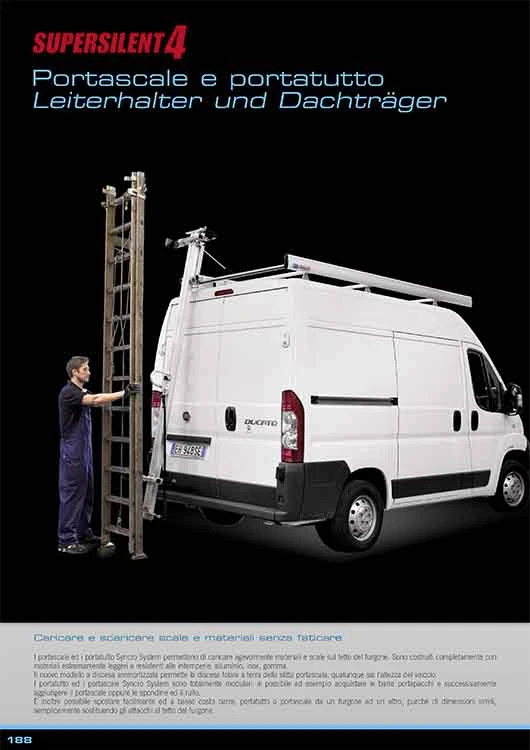 SYNCRO SYSTEM, IT'S HERE – THE NEW 2015 CATALOG: DISCOVER WHAT'S NEW FROM SYNCRO FOR VAN CONVERSIONS! Here's a sneak peek - right now! This year, once again, Syncro System reveals all its latest innovative products in the new 2015 catalog. It not only showcases the time-tested core products of the group, but shows off our new innovative solutions - created to meet the evolving needs of our clients, and all designed, developed, and manufactured in our headquarters in San Zeno di Cassola, in the Veneto region in north-eastern Italy. This is the fourth generation of our modular roof transport system - created and patented by Syncro System, it ensures increased reduction in noise and vibration while on the road. The newest version guarantees about a 20% overall improvement in its aeordynamic performance, as well as lighter weight crossbars. Click here for more details. Also part of the Syncro commercial vehicle rooftop solution systems, Syncro introduces its new tube carrier with modernized look and sleeker lines, with locking end cap. 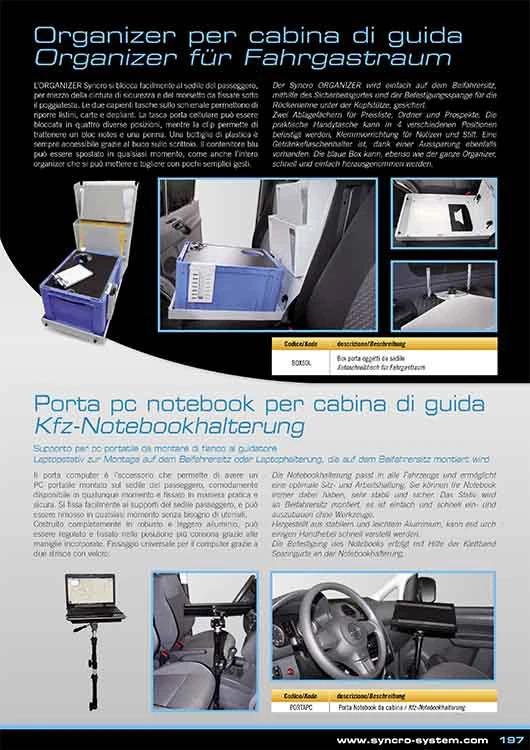 Among the new accessories designed by Syncro, are the laptop/notebook stand and van cab office organizer-desk with space for holding catalogs, cell phone, water bottles, pens, tape, etc.... These are favorites of those who use their vans, both as a workshop in the back and an office up front. Total customization is in your hands with this fully integrated Syncro solution. Thanks to these simple yet versatile aluminum bars and five different brackets. Thanks to our new innovative patented hinge, the door panels mounted on the Syncro racking components slide downward and outward, allowing maximum wide-open access to the storage compartment, and without any protruding parts when the door is fully closed. Interior cargo protective panels, now also available in extremely durable, chequered-plate aluminum. Two adjustable clamps that slide easily into position, quickly securing ladders and other cargo. An adjustable hook that slides into the track to easily secure cables, tubing and other materials. A metal case to store and transport diesel burner nozzles. Large workman-tough metal drawer unit for storing all kinds of materials and equipment. The new folding cargo ramps with increased maximum loading capacity and improved design, making it even easier to load and unload cargo. 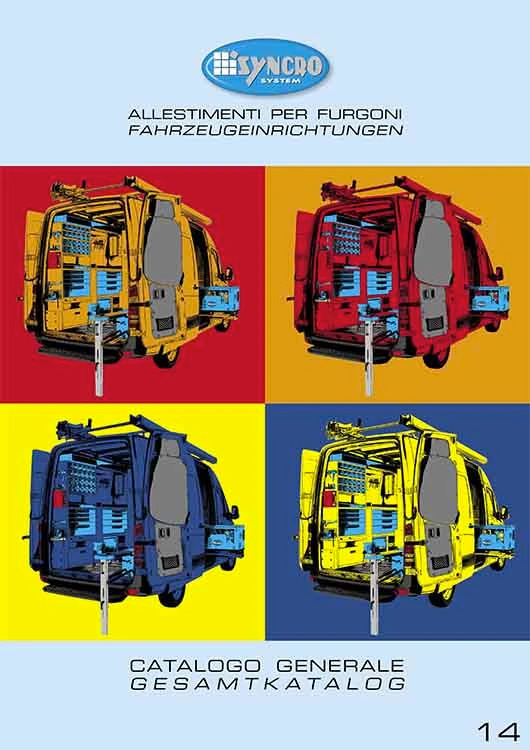 Want to download the new 2015 # 14 edition of our catalog – Syncro System van conversions? 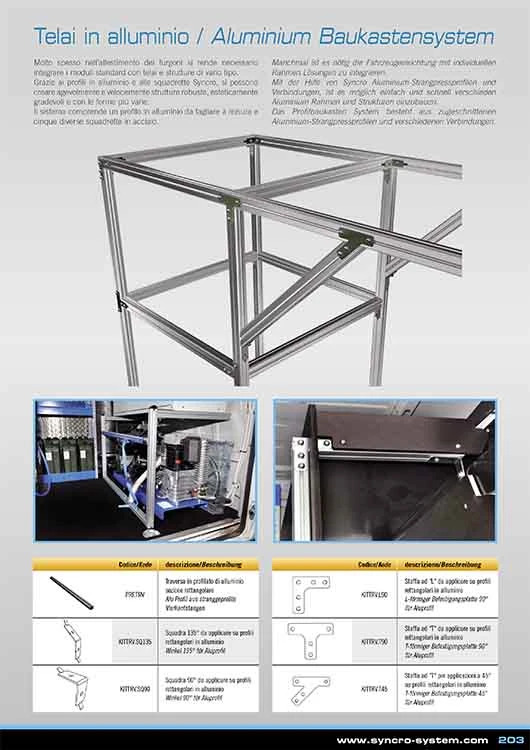 In the new, #14 catalog (updated at the end of 2014), you can really find everything – even the history of the Syncro group, from its very beginnings, up to today along with all the changes that led to its earning its place among the leading European companies in conversions on mobile workshop vans. The latest volume, which you can pick up at any Syncro center, has a brand new look, new graphics and an overall layout that's easy to read and understand. There is also a section of finished van conversions – divided by van make and model. So it's easy to see real transformations on real vehicles and get great ideas on how to convert YOUR van into a highly efficient workshop on wheels!